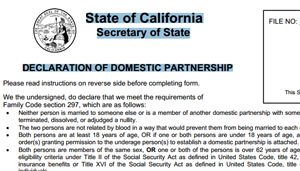 There’s a licensed Notary Public at Ideal Choice Insurance in Imperial Beach who will notarize Declaration of Domestic Partnership forms – also known as a ‘Domestic Partnership Agreement or DPA’ – in his office – free of charge! Walk-ins and appointments are available Monday – Friday 9am to 6pm and most Saturdays 10am to 2pm. Of course, the notary will notarize other documents too, however those will be changed at $10 per signature. “An activist has to make money too!” the Notary was heard to have said… on his way to another loan closing, refinance signing or some other required notarization. Mobile Notary Service also available – rates subject to time and distance – contact us for more information.